Joy Creek Photo Archive (c) all rights reserved Crocosmia 'Star of the East' bears large outward facing soft orange flowers with paler centers. This excites visitors who stroll by the orange section of the Rose Garden. The persistent orange seed heads are also attractive. Midsummer to midautumn. 28 in. 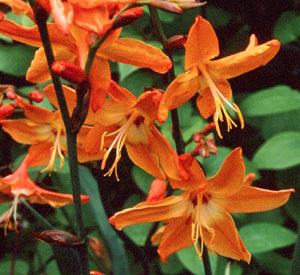 Brilliantly colored six petaled tubular flowers on arching stems rise out of lance shaped foliage in high summer. These cormous perennials are treasures from South Africa for the hot sunny border. Hummingbirds war over their blooms. Good for cut flowers. The dried seed heads are very attractive and useful for late summer and early fall arrangements.